Could the Elephant be Replaced by A Porcupine? Republicans are now waking up to the worst hangover imaginable in the aftermath of their rather unconventional “convention” in Cleveland last month. The brain-fog may be clearing but the terrible pounding headache resulting from the bizarre party “party”, the likes of which could only be attributed to a combination of cheap moonshine bourbon, kitchen-sink amphetamines, and some form of really weird acid, will linger for the rest of this election cycle. With his poll numbers falling faster than a ball-bearing in the vacuum of his vapid policy proclamations and Putin pandering it is becoming increasingly obvious that Donald Trump has little chance of victory in November. Real Clear Politics numbers show Clinton having a comfortable and growing lead in every battleground state, and the books in Vegas are now giving Clinton 76 / 24 odds. Most polls are also pointing to at least a 50/50 split in the Senate (Vermont independent Bernie Sanders and Maine’s Angus King caucus with the Democrats) and the very strong possibility of this becoming a 51 or 52 seat majority. Only the House seems safe for the party with the Republicans securely gerrymandered into control until at least after the next census in 2020. The GOP itself is in disarray with some leaders still offering a tepid support of Trump’s candidacy for the sake of whatever semblance of “party unity” remains as they try to seize control of their speeding locomotive rapidly approaching its inevitable head-on collision with reality. Others have distanced themselves or outright declared that they will not vote for the party’s standard-bearer in November. Only the true-believer neoconservative lunatic fringe remain as his actual allies, and the question becomes one of what happens to the GOP come January now that the most fractious election in modern times has laid bare the wide gulf between pragmatic party regulars and the various far-right factions. One beneficiary of the looming Republican train-wreck is Gary Johnson and the Libertarian movement. With no real chance of victory this November despite his beyond-unlikely strategy to seize sufficient electoral votes to throw the election to the House, Johnson and the Libertarians may be the new face of a viable center-right party in the future. Some have suggested that Johnson might actually capture the six electoral votes in Mormon dominated Utah this year, a normally solid red-state where The Donald is as popular as a chlamydia outbreak in a monastery, and perhaps a couple more in Nebraska, one of two states which allocate electors by Congressional district. With its philosophy of individual liberty and small-government friendly politics, the Libertarians are a natural refuge for disaffected GOP voters and center-right independents fed up by the party’s pandering to social conservatives and race-baiting xenophobes spouting anti-immigrant rhetoric. If many disaffected Democrats are “feelin’ the Bern” in the aftermath of revelations that the DNC rigged its nomination process in favor of the establishment candidate, even more Republicans and center-right independents are fried to a crisp over the meltdown of the GOP and its complete abandonment of principle for the sake of pandering to the worst instincts of its most extreme elements. Political historians are not in solid agreement as to whether the party alignment we have been working with since the mid 1960s represents a “sixth party system” or a continuation of the “fifth party system” that emerged with FDRs New Deal, but by whatever designation it becomes known it is almost certain that a new party alignment will emerge in the aftermath of what is clearly the most disruptive election since the end of the gilded era and perhaps since reconstruction. The Democratic Party has some serious soul-searching to do, and its leadership and direction will doubtlessly be shaken up in the wake of the duplicitous behavior confirmed in the recent email leaks. That being said, the Democrats will emerge in an evolved form as they heal the internal infection and work on the long overdue integration of the more progressive stance represented by the ongoing Bernie Sanders revolution. 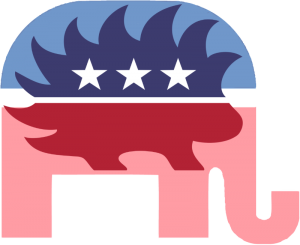 The GOP faces a far more existential challenge, and who ends up owning the Republican brand remains to be seen as does how much that brand continues to look like the elephant we have come to know or how much it begins to resemble the staunchly independent and individual-affirming Libertarian porcupine. This will be a story for the history books.